If you have a dry (not sweet) white wine open, you're in luck because you can enjoy two wildly different candies, and enjoy them equally. Start with Skittles; these sweet, fruity candies are a great way to break into that dry white. Before you finish the bottle, try a sip with a bite of Butterfinger – especially if you have a California Chardonnay open. You can try Skittles again but if you have a sweet Riesling open, bite into a Reese's Peanut Butter Cup! One of the first pairings I tried when I began learning about wine was Peanut Butter and Riesling (or Gewurztraminer). This is a fun one – drop Nerds into sweet champagne or Moscato to watch them dance before enjoying this winning combination. Here's a simple pairing: Zinfandel and plain chocolate (M&Ms, Hershey's bars). So simple, I have nothing else to say about this one. “Snickers-broken” by Evan-Amos. Licensed under Public Domain via Wikipedia. If you are sampling chocolate candy with wafers (Kit Kat) or a whipped center (3 Musketeers), Merlot is a good choice. But if you're a fan of Pinot Noir you should try Snickers (which is awesome, since I love Pinot Noir and I LOVE Snickers!). Finally, if you have a dark, full bodied red open, grab dark chocolate. Sometimes you'll luck out and get some of those little Hershey's dark chocolates (and if you're really lucky, your kids haven't discovered how delicious dark chocolate is yet) but more likely you'll get Mounds bars and your kids will think the coconut is disgusting. Lucky for me, I like coconut. So there you have it: some suggested wine and Halloween candy pairings. 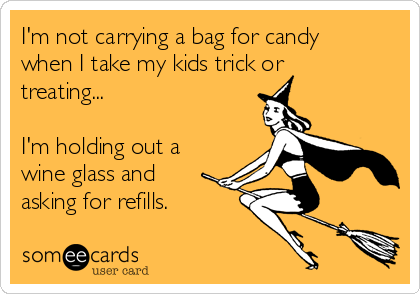 It's easier to switch the candy that you're tasting with a single glass of wine, but try some different combinations. Hopefully this guide will get you started.